ANN ARBOR, Mich. (AP) — Kaleb Wesson was alone behind the defense, with a chance for an easy dunk or layup. Zavier Simpson — 9 inches shorter — never gave up on the play. Simpson hustled back and blocked Wesson’s shot , and soon after that, No. 5 Michigan broke the game open against rival Ohio State, beating the Buckeyes 65-49 on Tuesday night. In addition to that blocked shot, Simpson finished with a triple-double — 11 points, 12 assists and 10 rebounds. The Michigan point guard also had no turnovers in 35:51 of action in an emotionally charged game. Jordan Poole scored 15 points for the Wolverines (20-1, 9-1 Big Ten), who led by six at halftime and kept the Buckeyes frustrated after that. Ohio State (13-7, 3-6) has lost six of seven, and the Buckeyes’ chances of an upset in Ann Arbor were done in by their 19 turnovers. It wasn’t the easiest night for either team offensively, but Michigan ended up 10 of 27 from 3-point range, and Ohio State (5 of 21) didn’t come close to matching that. Wesson led the Buckeyes with 12 points, but much of that was early. The Wolverines led 32-26 at halftime. After Wesson opened the second half with a 3-pointer, Michigan slowly extended the lead, going ahead 44-33 on a 3 by Poole. Simpson later connected from beyond the arc to start a 9-0 run that made it 56-38. Simpson seemed to be everywhere in the second half, including in a brief skirmish that resulted in technical fouls for two players from each team. With sub-zero temperatures in the forecast, Michigan canceled classes Wednesday and Thursday. That may have brought the student fans to even more of a fever pitch for this matchup with the rival Buckeyes. There were profane chants throughout the night, and the crowd roared with just under 3:00 remaining, when Simpson’s 10th rebound gave him the triple-double. 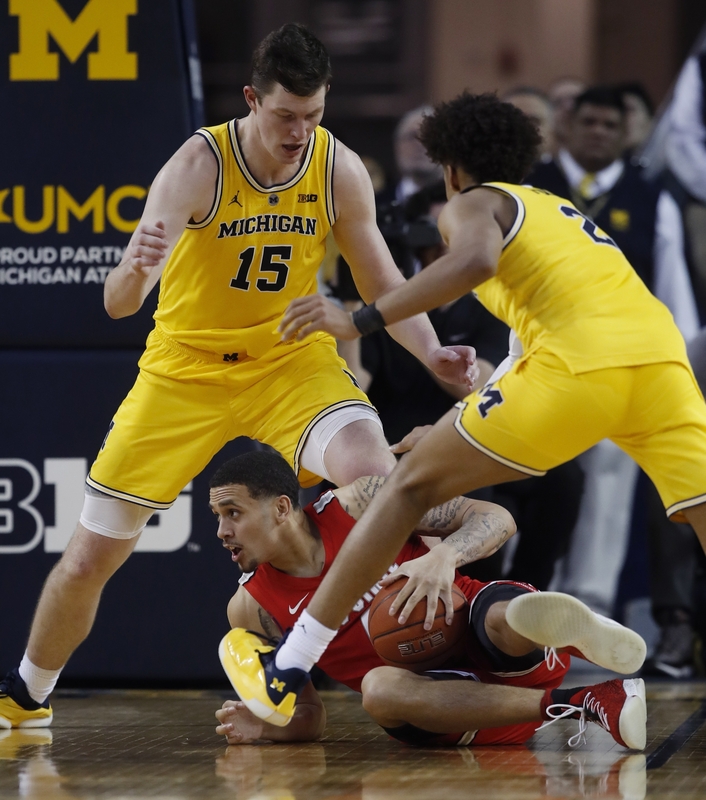 Michigan’s football team lost 62-39 at Ohio State in November, and it was fair to wonder if Beilein’s tenacious team would allow that many points in the basketball matchup. On the contrary, the Wolverines held the Buckeyes under 50 for the first time in this rivalry since Jan. 29, 1949 — 70 years ago to the day. Michigan won that game 54-48. Simpson, who is from Ohio, exemplified the chip on Michigan’s shoulder against the Buckeyes. Ohio State: The Buckeyes have been without injured forward Kyle Young for three games. They snapped a five-game losing streak with a win at Nebraska last weekend, but they don’t appear to have righted the ship. Once Michigan started shooting better, Ohio State had no answer. Michigan: It was a comprehensive win for the Wolverines, even if it stayed close for a half. Beilein now has 120 regular-season Big Ten victories, tying Johnny Orr’s school record. Beilein also holds the overall school record with 268 wins. It was an impressive win for Michigan, but not a particularly surprising one. There’s more work to do later in the week. Ohio State: The Buckeyes will have a chance to get back on track with a couple home games — against Rutgers on Saturday and Penn State next week. Michigan: The Wolverines play at Iowa on Friday night.